Synopsis: Raina is looking forward to the family reunion in Colorado, but she’s not looking forward to spending three weeks in the car with her younger sister Amara. Sure, when she was younger she really wanted a sister, but the older the girls get, the harder it is to get along. Will the girls survive the road trip and put aside their differences or are they doomed to fight forever? Why I picked it up: I loved both Smile and Drama, so I was eager to pick this up. 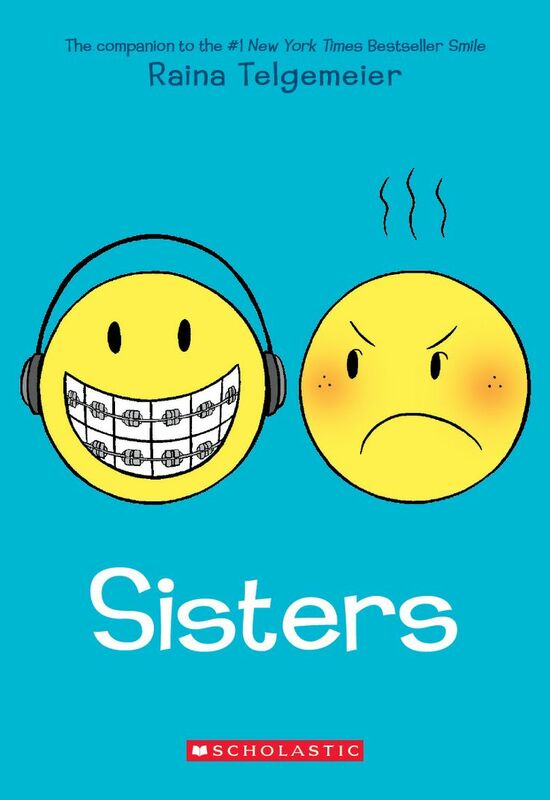 Why I finished it: Growing up with a younger sibling, I can totally empathize with Raina and the numerous disagreements she has with her sister and brother. Those readers with younger siblings will definitely identify with the Telgemeiers as well, and those of us that have survived family road trips know how difficult it is to spend so much time so close together. Telegemeier interweaves narratives from both the past and the present, juxtaposing the years, months, and days leading up to the road trip with the road trip itself. The reader gets to see a little bit of Telgemeier’s life growing up, and she invites the reader into a family album of sorts. We’re seeing a slice of the lives of other families and it makes us feel more normal somehow, knowing that we’re not the only family where the kids don’t get along or always feel like they fit in. There is a poignant moment in which Raina’s mother points out that both girls are artists, and that this is something that they will always share. It brings home the notion that there is always something special that can be shared between siblings, something they can remember even when they get older; there will always be a connection. I love Telgemeier’s art because it has a nice balance between fun and serious, and Braden Lamb’s color work really brings to life the landscapes both outside and inside the car. It has a distinctively cartoon feel, but remains realistic and relatable like Calvin and Hobbes and For Better or For Worse. It’s a quick read and a sweet story about the dynamic between siblings and how at the end of the day, they will always be the ones to have your back. Synopsis: Callie loves theater, but he knows she’s not good enough to try out for her school production of Moon Over Mississippi. So instead she joins the stage crew with the goal of making this the best drama production ever, even though she doesn’t know a lot about carpentry, the cast and crew don’t get along, and ticket sales are down. Drama on and off the set is complicating things more and more – will the show go on or will the curtain fall before the show even starts? 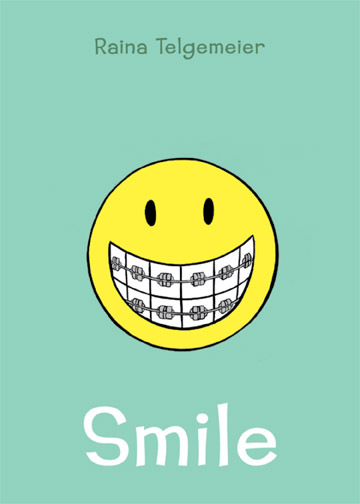 Why I picked it up: I loved Smile and I was so excited to hear that Telgemeier had written another book. Why I finished it: This book is so perfect in its portrayal of junior high relationships and the ups and downs of crushes. Callie is an exuberant and likable main character, and I totally felt for her throughout the book, cause I am pretty sure most junior high girls have had their heart broken before things had a chance to happen. I like that the chapters of the book were divided into Acts just like a stage play and Telgemeier even cleverly inserted an intermission halfway through. I am also a huge fan of the art, which helps to reflect the middle school feel of the book. The style lends itself well to the audience and gives the story a realistic feel. I enjoyed that the colors are so bright and fun, and that some of the characters have non-conventional hair colors. The plot moves along nicely and I wasn’t ever bored nor did I want to skip over anything. Shamefully, I read through it rather quickly, but it was so engaging that I didn’t want to put it down. I can’t wait to see what Telgemeier does for her next book! Synopsis: Raina is just a normal sixth grader until she falls and severely injures her two front teeth after a Girl Scout meeting. Now, not only does she have to get braces, but she has to wear fake teeth and carry around dental floss, wax, and a whole lot of other stuff that is just embarrassing! Will Raina be able to smile again or is she doomed to live forever without her two front teeth? Why I picked it up: I wore braces in junior high and had to carry around a whole arsenal of dental supplies just like Raina. 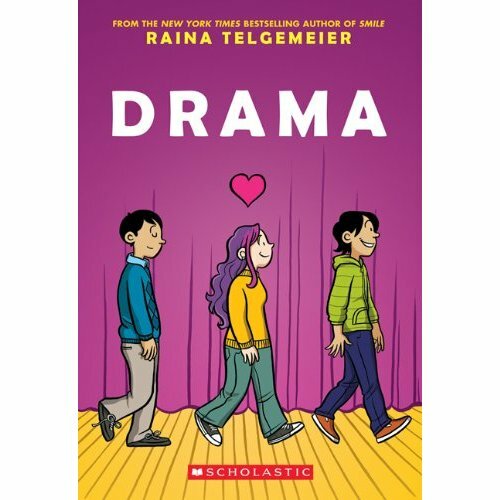 Why I finished it: Though Raina’s story takes place in the late 80s/early 90s, there is something timeless about the struggles she goes through: dental drama, secret and not so secret crushes, friends drama, and everything that made junior high, well, junior high. Some of the references might go over the heads of the current generation (it makes me feel old when I realize that I know who the New Kids on the Block are…though I was an N’Sync girl myself), the dilemmas are still the same. I loved Telgemeier’s art, since it really brought the story to life without being over-the-top cutsey. As aCalifornia girl, I loved the way she drewSan Francisco, which makes it apparent that although she has bad memories of a certain freeway off-ramp, she does love the city. I’d highly recommend this book for junior high girls, those of us that were junior high girls, and those of us that genuinely feel we survived junior high in one piece.